Two actors, minimal/slick set design, and some good music. It was a full house, as expected, but I have to be honest and say I was disappointed. I found the script, by Mat Smart, to be too facile, too flat, too “glib” as one of my friends said. The play was a crowd pleaser to be sure – it had humor and some good dialogue, especially when Anthony and Douglass slugged it out – first on the subject of the 15th amendment which was passed in 1870 (why should Black men get the vote before women?) and then on the issue of segregation within the Suffrage Movement (Black women were excluded from conventions in Southern cities such as Atlanta as well as from the 1913 parade in Washington, DC). The 19th amendment, which guaranteed all American women the right to vote, was finally passed in 1920. 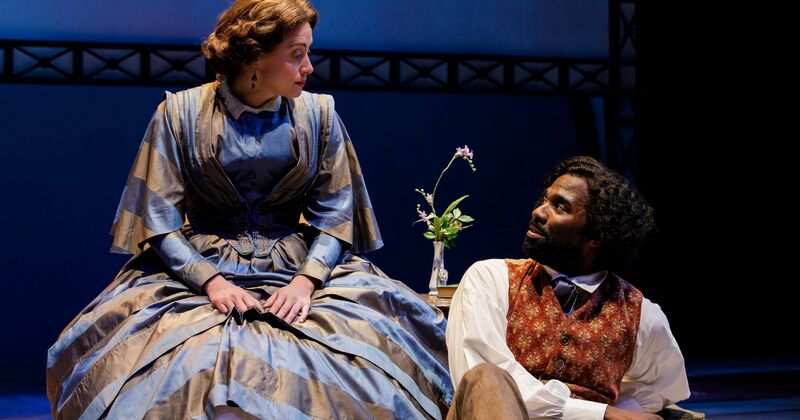 During the first act, I felt like Frederick Douglass played a supporting role to the formidable Susan B. Anthony. She was the one who challenged and chided and got most of the laughs. To me Douglass has always been a towering figure, physically, intellectually, and in terms of presence and charisma. It’s incomprehensible to me that he was born into the savagery of slavery, that he not only managed to escape but was able to build from scratch immense moral and mental capital. Sadly I didn’t feel this power in the way Douglass is written. Perhaps if the script had been populated by other characters, not just two icons, there could have been a frame of reference, something to anchor but also project these historical giants in all their vivid peculiarities and complexity. Complexity is what was missing from the play. It needed more research, more meat, a better sense of how Anthony and Douglass spoke back in the day, how they interacted with friends, how they moved and gestured, and created discomfort around them. Although this is a great celebration of Rochester’s history, what about the inconvenient reality of what Rochester is today? Number 1 in poverty and number 4 in childhood poverty in America. What would Douglass and Anthony say about that? This could have been an interesting frame for us to explore our past. And perhaps this is why the smooth, lightweight easiness of the play sticks out like a sore thumb. My friends and I looked around the audience. There were hardly any people of color present. One could count them on the fingers of one hand. There were no young people. It might have had something to do with the fact that tickets were, for the most part, in the $50 to $70 range and that Rochester is painfully segregated, along racial/economic lines. What an irony to produce a play about Frederick Douglass, in the city where he did some of his most important work, and exclude the vast majority of those he fought for, those who know him best? During the Fringe Festival I was lucky to attend “Anatomy of a Black Man” by Anderson Allen and Shaquille Payne. It was anything but slick or even, it was down to earth and abrasive and real. It had substance, it had heart. This is the kind of material I’d like to see Geva pick up and Logan Vaughn direct. Let’s say it like it is. We owe it to Douglass and Anthony’s legacy.